I promised a Louvre story this week as the Friday Fact so let’s first get the fact out of the way and then I’ll tell my story. The Louvre was initially built as a palace and fortress in the 12th century. By the middle of the 1500s, a new building was erected on the site by King Francis I of France. In fact, this king was the one who obtained the Mona Lisa and some other Da Vinci paintings for his royal collection. In the latter 1500s, Catherine de Medici had the Tuileries palace (destroyed in1871) built which connected to the Louvre. During the French Revolution, 1791 to be specific, a law was passed making the Louvre a museum for the people named the Musee Central des Arts. Napoleon added to the works of art there when he was in charge of France by looting the places he conquered and bringing their art to this museum (he changed the name to the Musee Napoleon). Some of the great pieces are sculptures- Roman, Greek and Egyptian. Nike or Victory, of Samothrace is one of the awesome statues there ( I did get a great look at it since it was at the top of a flight of stairs). 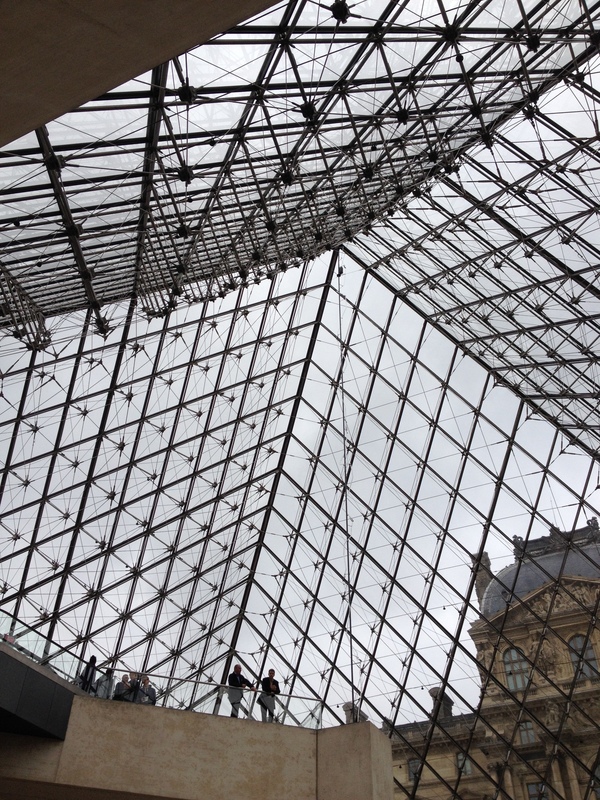 In the 1980s and 90s, the Louvre was expanded to include some underground areas. I.M.Pei designed the glass pyramid which is now the entrance. People hated it at first and it caused a lot of controversy but now it’s considered iconic and a Paris landmark. My story involved the craziness of the place. It is over-run with tourists as is to be expected but it’s a weird group in there. The people seem to want to dash from one major piece of art to the other with no regard for the other items in the place. We could see them almost running from one to the next- looking at the map for the most famous pieces and taking a selfie then running to the next one. 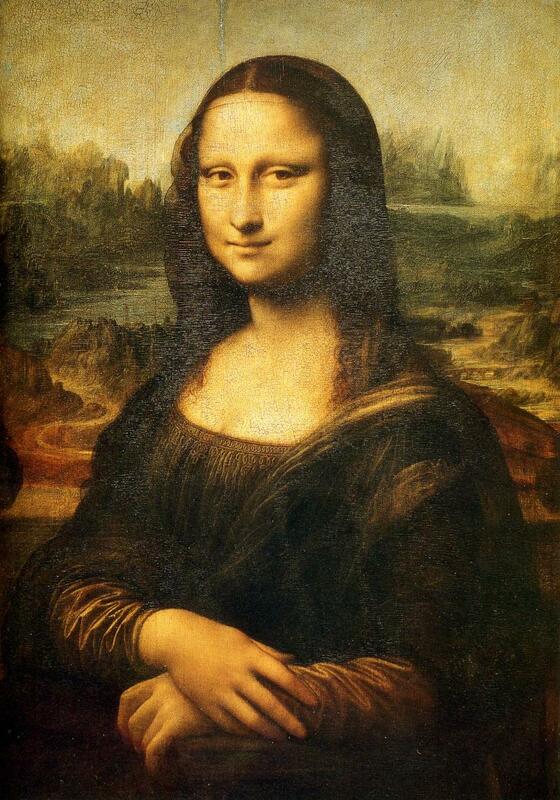 My son asked me after about an hour how many people did I think were in that building who actually like art versus how many were there because they wanted to prove they’d seen Mona Lisa. I said there were probably 5 art lovers in the place. Talk about funny. I told her we’d already decided there were only 5 of us who like art in the place and she laughed and said she wondered where the other two were. LOL! How funny that we had the same thoughts. When we eventually made it to the room where Mona was hanging out, you couldn’t get near her. My son fought the crowd and got up there but I stayed back and took a picture of the craziness. This was they way these people massed themselves at every major work. 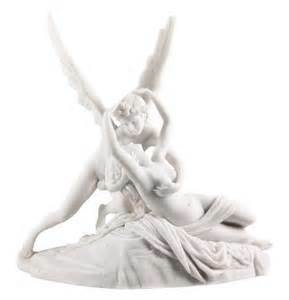 I couldn’t get near the statue of Psyche and Cupid either. I got a pretty good glimpse of it through the crowd but not like I would’ve liked. What a shame, all that art and no one truly appreciating it.I am glad you, your son and the lady sound each other.The other two art lovers were probably wandering around, lost, feeling alone in the world. What a laugh! I am encouraged, however, that there are people in the world who actually CARE that people knew that they saw the Mona Lisa; I’m afraid it wouldn’t make an impression on many of the people that live near me.I wish you could have gotten even more out of your visit. Yes, it is, Liv. Wait til you hear the Versailles one. Just say no to Versailles is the moral. 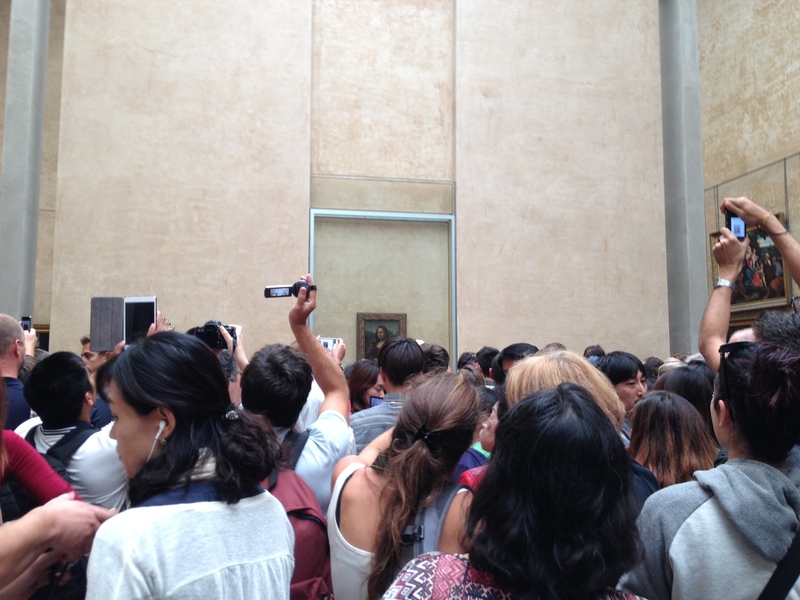 Wow, hard to believe the crowd around the Mona Lisa. I wouldn’t want to be part of this so Versailles is holding no pull for me. Another experience the good and the bad of it. I remember when the King Tut exhibit was in Seattle, we went and could hardly see it for the crowds and that was with them only allowing so many in at a time. I’ve never gone to something like this again. Maybe if I was six foot something but for the most part all I could see was body parts of all the people surrounding me. I totally agree Lavada. This takes the fun out of it for me for sure. I am 5â4.5â and I see a lot of peopleâs heads and shoulders. I can relate to your King Tut disappointment for sure. Wow, that is insane. And I agree with Tonette. What a shame. I’m so glad that, in all that madness, you found at least one other kindred spirit. And I’m betting you came away with an even deeper appreciation for art and imagination. Too bad all the folks massing around didn’t. It’s their loss. It WAS insane. Crazy. And yep, a kindred soul is always good to connect with. I agree about the loss of the other folks. I remember that crazy crowd. We were there in 2004 or 2005. The best part of my Louvre experience were the pieces I got to enjoy in peace. This was also the trip I learned not many people seem to understand personal space, lol. Amen on the personal space thing. We figured that out, too. Especially the people from the country with billions of citizens. I guess they have no space so they have no concept of it. LOL! AND yeah, there were some great pieces to enjoy in peace. Lexi, the line was massive to get in – we started way back at the end of the courtyard but it only took about 40 mins. I was shocked at how fast it moved. It was worth it to me but later in the week when we went to Versailles, I wish I’d left before standing in that line. That experience was awful. They let way too many people in there and it wasn’t enjoyable at all. That’s the trouble with 1) having to go during August and 2) not having enough time. I was so lucky to travel as much as I did during off seasons. 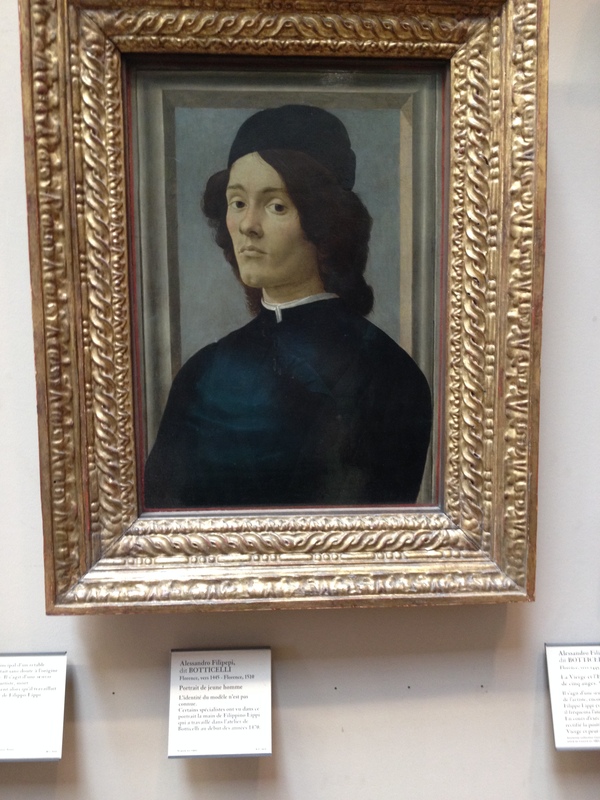 I did get to stand quietly in front of the Mona Lisa (& isn’t that a Raphael you posted?) and considered myself blessed to be able to. But hey, it’s a blessing to get to go to Paris at all, isn’t it? And with your son! Yeah. It was a blessing for sure. I love to travel with that kid. The issue when you do that is school schedules. LOL! The university system in Fla requires one summer on campus so they can keep funding for the school so this was his summer of classes and we had to fit in the trip between that and court. Off season is MUCH better, I agree. And I think that is a Raphael. I’ll go back and look as I made a note of it. the picture I was studying was a Botticelli, Meredith- portrait de jeune home- a young man! ah–it was familiar anyway. There are so many fabulous pieces in the Louvre. next time we’ll go together! There really are and yep, it’s a date! I’ll hold you to it. Sounds good. We’ll have a blast. 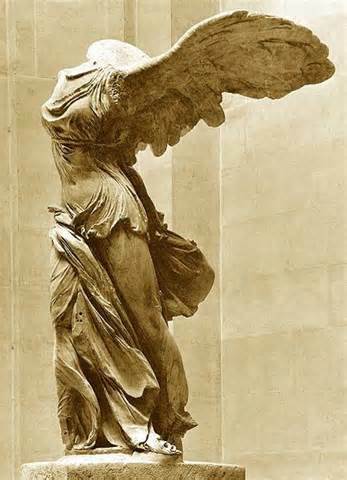 As famous as the headless Samothrace Victory is the armless Venus of Milo . Not a look at this wonder ? And to me the most brilliant part of the Louvre is the mysterious Egyptian Museum, one of the 3 greatest with the British Museum’s and the Cairo one . ( If you feel like buying the missing head and missing arms, you can make an offer ) . I was lucky enough to see the Egyptian collections in all 3 places. And the Elgin marbles in the BM as well as the Acropolis. I have to say, seeing the objects in their original location is unmatchable–BUT since most people don’t have that opportunity, it’s not wicked to have some in central locations like Paris and London. Still, riding up to the Great Pyramid or sitting on an ancient stone staring at the Parthenon…well, what can I say? Lucky you, Meredith. Egypt has long been on my âsome dayâ list. I also love the Elgin Marbles. Iâve even put them in 2 of my books by having characters visit the BM. OOOOH, no, you didnât; sounds amazing. Get to work so I can read it. Never been to Greece, but I spent 2 months in Egypt travelling on my own . I visited even the least known places, in summer and always around noon . This way I could be alone . Stayed several times 10 minutes alone in the King’s chamber, and one hour in the subterranean chamber one day when there was a power cut . Even the mighty Abydos just for me for a whole afternoon . That’s better than a museum for sure ! When were you there? I lived in Cairo for a year back in the 1970s. Time to go to Greece is February. We were the ONLY people in Mycenae & I spent a hour sitting in before the Parthenon and no one came between me and my view. Salad days! Awesome, Phildange. I love that. AND yep, the real thing in the original site is much better than a museum. Good old days, where are they now ? I went to Egypt in 1992, for I wanted to be 33 in the Great Pyramid . And alone ( well that one wasn’t expected ) . I think it was the last year for travelling freely in Egypt, since a few months later, wild religious riots bursted in the coolest town, Assiout, where they slaughtered Egyptian Christians, Copts, and they blew a German tourists bus . After that, Middle Egypt became forbidden to lonely travellers, unless in heavy convoys guided by soldiers . And I don’t mention the new painful rules when you want to visit Gysa .